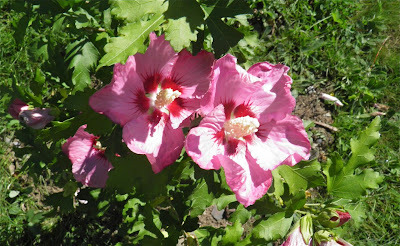 Devoid Of Culture And Indifferent To The Arts: Gardening: Tropical Blooms in Nova Scotia? 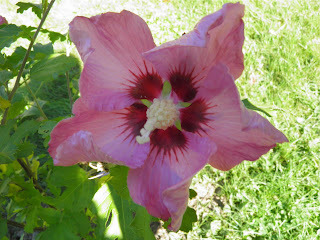 Hardy Hibiscus! 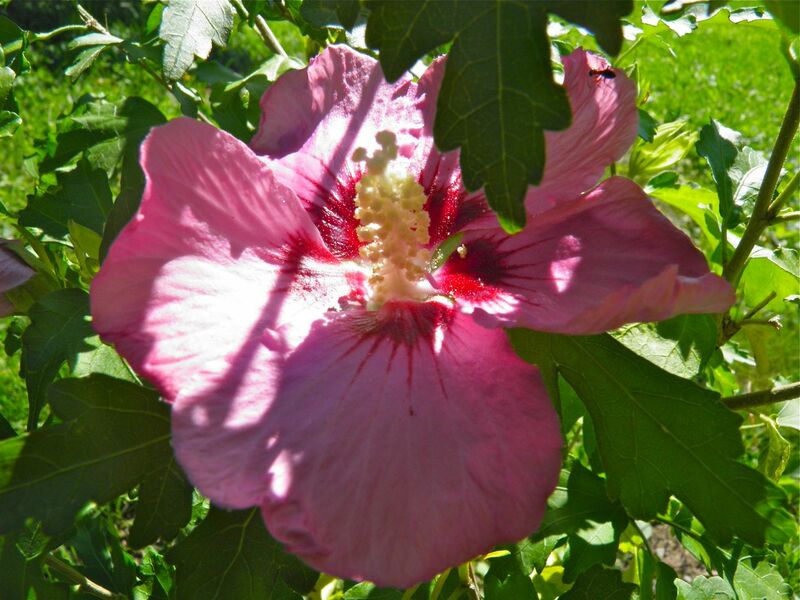 Gardening: Tropical Blooms in Nova Scotia? Hardy Hibiscus! My mother’s birthday is coming up soon so a few weeks ago, as part of her present, we bought her a plant. We often do. As you get older you really don’t want more “stuff.” It’s far nicer to have something you can enjoy. 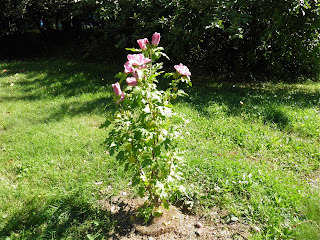 We went to a local garden centre and bought a hardy hibiscus. Hibiscus Syriacus, to be exact. We found it at the Village Nursery, in Pleasantville, just outside Bridgewater on the South Shore. And it was on sale!! There’s a few tropical looking hibiscus that will overwinter in Nova Scotia. One is Moscheutos with its flat dinner plate-like flowers but only last one day; another common one is “Rose of Sharon” (which is a Syriacus) but usually the flowers are much smaller than the one I’m talking about. This cultivar really lives up to the hibiscus name. It is a woody, deciduous shrub and has the typical exotic looking blossoms that we associate with tropical climates. The flowers are about 3-4” wide and have the classic pistil and stamens jutting from the centre. Syriacus is hardy to USDA Zone 5a. That’s more than enough to last the winter in Nova Scotia. Syriacus is vase shaped and can reach heights of 2-4 metres. The flowers come in colours from white, pink, red, lavender to purple, and are edible. Bloom time, depending on your zone, can be anywhere from late Spring through to early Fall. My mother’s plant seems to have a blooming cycle of late summer through early Fall. The flowers are stunning and even though the plant is only one metre tall, it is covered with blooms and buds. I’m sure she will be enjoying the blooms for over a month. Usually hibiscus flowers only last one day, but for some reason the flowers on this plant close at night and reopen the next day. Bonus! Pruning helps encourage flowering. It is only to be done in late Spring. It is not difficult and will promote a mass of large stunning flowers. To prune just shorten the shoots off the main stem by 2/3, leaving the remaining third to develop new offshoots. My mom is very happy with this plant. It’s planted close enough to the house that she can look outside and enjoy the display it is offering from the comfort of her chair. When I was speaking with the owner of Village Nursery she said that they were going to have blue ones for sale next year. Maybe I'll see you there. I'll be going as soon as they open! I would strongly suggest this plant for anyone who wants a taste of the tropics in their backyard. They're beautiful. At Zone 5 it is almost certain to come back each Spring and increase in size and pleasure every year.